You are here: Home / Archives for By Saint / St. Diadochos of Photiki ca. 5th cent. Lk. 12:20 But God said to him, Fool! This night they demand your soul from you; and that which you prepared, to whom will it be? Eph. 6:12 For we do not wrestle against flesh and blood, but against the rulers, against the authorities, against the cosmic powers over this present darkness, against the spiritual forces of evil in the heavenly places. Also related to the foregoing is the teaching of both Holy Scripture and the holy fathers about the taxing of souls… We find this topic in the whole biblico-patristic tradition and it corresponds to a reality which we need to look at in order to prepare ourselves for the dreadful hour of death… According to the teaching of the Fathers of the Church, the soul at its departure from the body, as well as when it is preparing to leave, senses the presence of demons who are called customs demons, and is possessed with fear because of having to pass through customs. Of course we must say from the start that the customs demons have no sovereignty over the righteous, those who have united with Christ. The righteous not only will not go through the “customs-houses”, but they will also not be in fear of that. We shall see this better when we compare the teachings of the Fathers… the tax collectors, in their effort to collect as many taxes as they could — and especially in order not to let some people escape who could not accept the very heavy and unjust tax — contrived various means: they would lie in wait in narrow roads and seize passers-by, forcing them to give what they owed. It was very unpleasant and odious to the people of that time. It is just this familiar and odious image which the Fathers used in order to give the people of that time an understanding of the terrible mystery of death and of the terrible things that unfold when the soul is being prepared for departure, especially when it is leaving the body. The image of the tax collectors certainly belongs to the reality of that time. 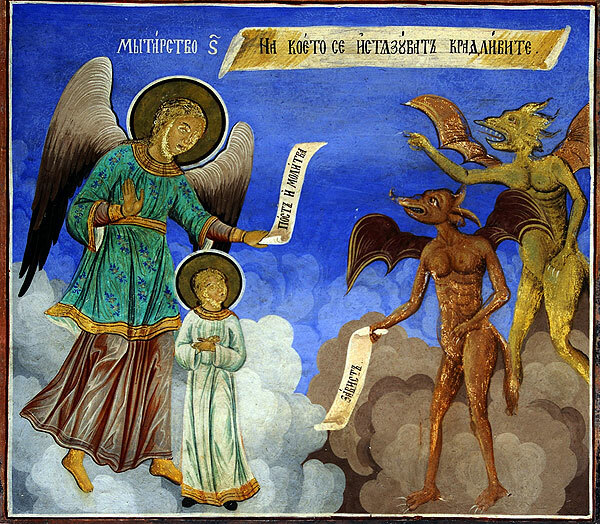 But the teaching that the demons try to seize a man’s soul at its departure is mentioned in many texts of Holy Scripture and of the Fathers of the Church. 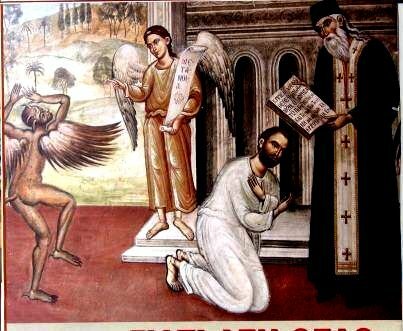 We have already seen that after death the souls of the righteous are received by the angels and the souls of the of sinners by the demons. With the malice which all the demons have against men, they would like to dominate everyone and have them in their power forever. But they cannot have authority over the righteous. St. Paul, referring to the spiritually dead who were deprived of the grace of God, writes: “And you He made alive, who were dead in trespasses and sins, in which you once walked according to the ways of this world, according to the prince of the power of the air, the spirit who is now at work in the sons of disobedience” (Eph. 2, 1-2). This passage indicates that men are deadened by sins and the work of the devil. Likewise the devil is characterised as the prince of the power of the air because he is in the atmosphere and is constantly waging war on men. It is precisely this image which the Fathers have in view, saying that when the soul leaves the body and passes through the air towards heaven, it meets the ruler of the air. The passage also mentions that this ruler is working now too in the sons of disobedience. For once, when about to eat, having risen up to pray about the ninth hour, he perceived that he was caught up in the spirit, and, wonderful to tell, he stood and saw himself, as it were, from outside himself, and that he was led in the air by certain ones. Next certain bitter and terrible beings stood in the air and wished to hinder him from passing through. But when his conductors opposed them, they demanded whether he was not accountable to them. And when they wished to sum up the account from his birth, Antony’s conductors stopped them, saying, ‘The Lord has wiped out the sins from his birth, but from the time he became a monk, and devoted himself to God, it is permitted you to make a reckoning.’ Then when they accused him and could not convict him, his way was free and unhindered. And immediately he saw himself, as it were, coming and standing by himself, and again he was Antony as before. As for you, my son, shun the satisfactions of this age, so as to be happy in the age to come. Do not be negligent, letting the days pass by till unexpectedly they come looking for you and you arrive at the straits of your anguish and the ‘horror-faces’* surround you and drag you off violently to their dark place of terror and anguish. Do not be sad when you are cursed by men; be sad and sigh when you sin — this is the true curse — and when you go away bearing the sores of your sins. [T]he angel of the Lord that had appeared to him earlier in his [St. Macarius] life, appeared surrounded with heavenly hosts and said to him, ‘Come with us, for all of these are waiting for you.’ The saint replied and said, ‘My master Lord Jesus Christ whom my soul loves, accept my spirit.’ When he said that he gave up his spirit. Lk. 12: 58-59 For whilst you are going with him who has a suit against you in the way to the magistrate, give diligence that you may be delivered, from him; lest he drag you to the judge, and the judge deliver you to the exactor, and the exactor cast you into prison. I tell you, you shall not come out thence, until you have made compensation unto the last mite. Now perhaps it may be imagined that the sense of this passage is difficult to comprehend: but it will become very easy if we examine the metaphor by what takes place among ourselves. For let there be supposed, He says, some one who has brought a charge against you before one of those in authority, and has pointed you out to those whose office it is to carry the accused into court, and is causing you to be taken thither. “While therefore, He says, you are still with him on the way,” that is, before you have come to the judge, “give diligence,” that is, weary not, in using all your earnestness that you may be delivered from him. For otherwise he will give you up to the judge; and then, when you have been proved to be indebted to him, you will be delivered to the exactors, to those, that is, whose office it is to exact the money; and they will cast you into prison, and make you pay the last mite. LXX Isa. 3:12 My people, the tax collectors scourge you, and the creditors lord it over you. St. Symeon of Emesa, Fool for Christ ca. 6th cent. We were there at the end of Abba Stephen the Byzantine, I and Abba Theodosios the African who became the bishop of Babylon. As we were chanting the “Blameless is the man…” (Psa. 119 [118 LXX]) as is usual at the gathering of the soul, suddenly his face became very grim and with a commanding voice he spoke to something that appeared to him. “Why do you come here? Go into the outer darkness. You have nothing on me. The Lord is my part.” When we arrived in our chanting at this verse saying, “You are my part, O Lord,” Abba Stephen gave over his spirit to the Lord. Seeking a garment in order to bury him we found nothing at all of wealth and glory. I thank God that now I can the more fully meet thy wishes, because but lately I spoke with this brother myself, when he came back here from abroad; he set forth to me in his own words the marvellous spectacle which he beheld when rapt in spirit beyond the body… As he quitted the body, angels of such dazzling brightness that he could scarcely look upon them for their splendour, bore him up. With sweet and harmonious voices they were singing, “O Lord, rebuke me not in Thy wrath: neither chasten me in Thy hot displeasure.” “They raised me,” said he, “high into the air, and circling the world I beheld a blazing fire, the mighty flame soaring terribly aloft, as though to grasp the whole mechanism of the world in its embrace, had not the holy angel calmed it with the sign of Christ’s holy cross. When he had made the sign of the cross before the threatening flame, it gradually retired. By its terrible heat I was sorely tried, while my eyes were burned, and my sight was shattered by the brightness of the gleaming spirits until an angel, splendid to behold, touched my head with a protecting hand, and brought me safe from harm in the flames. But, O soul, whatever time you still have, give up your shameless deeds and convert yourself to a noble life. Turn to the Lord and cry out with faith: “I have sinned, Lord. But I know your mercy and love for men. For this reason, I fall down and beg your goodness to grant me mercy, O Lord! For my soul will be confused and will be sick at my having turned away from my repentance and at my wicked bodily deeds. May the evil powers never capture me and cast me into darkness for my invisible and visible sins of my whole earthly life. [W]hen it leaves the body, the soul finds itself among other spirits, good and bad. Usually it inclines toward those which are more akin to it in spirit, and if while in the body it was under the influence of certain ones, it will remain in dependence upon them when it leaves the body, however unpleasant they may turn out to be upon encountering them. 1 Jn 4:18 There is no fear in love, but perfect love casts out fear. For fear has to do with punishment, and whoever fears has not been perfected in love. Filed Under: All, Holy Fathers, Post-Mortem, Sacrament, St. Diadochos of Photiki ca. 5th cent.